A Chinese of Rank and The Chinaman of Rank. This very rare pattern was first produced by Spode in blue. The pattern number is L.19 and is documented in the Spode pattern book on a cup with pink luster. The source of the center pattern is the print titled A Chinese of Rank (shown below). Mason's and possibly a few other firms also produced this center pattern. However, the border pattern Masons used is different. Copeland and Garrett remained faithful to the same original center and border patterns as their predecessor, Spode. Print number P632, reference Spode Transfer Printed Ware 1784-1833 by David Drakard and Paul Holdway. Shown here are two sides of a slop bowl from a tea service in the same pattern. 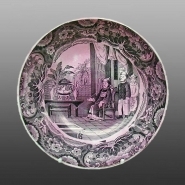 An earthenware cup and saucer printed in black "shaded" with pink luster wash in a pattern known as both A Chinese of Rank and The Chinaman of Rank. This very rare pattern was first produced by Spode in blue. 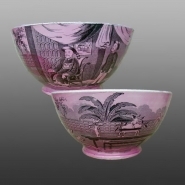 The pattern number is L.19 and is documented in the Spode pattern book on a cup with pink luster. The source of the center pattern is the print titled A Chinese of Rank (shown below). Mason's and possibly a few other firms also produced this center pattern. However, the border pattern Masons used is different. Copeland and Garrett remained faithful to the same original center and border patterns as their predecessor, Spode. Print number P632, reference Spode Transfer Printed Ware 1784-1833 by David Drakard and Paul Holdway.